The entire team at the ibis Styles Blois welcomes you! Take advantage of our location to visit the Château Royal, the Maison de la Magie museum, the Fondation du Doute, the Maison de la BD comic book exhibition and the magnificent ZooParc de Beauval. Breakfast + unlimited WIFI included in the price of the room at the ibis Styles Blois. Fully renovated in 2011 and features 52 air-conditioned and soundproofed rooms. In the heart of the city, our hotel is 109 yds (100 m) from the train station + 5 mins f rom the Château de Blois. Its contemporary design combines modernity and comfort. An ideal base for business trips or visits to the Loire Valley châteaux. Enclosed car park. On-site meeting room. Light meals at the bar or via 24-hr room service. Private paying parking garage, reservable on request. A city steeped in history, a contemporary, urban design hotel, and an understated and relaxing atmosphere. Renewed pleasure at each stay. Enjoy our Le Bistrot restaurant from 7pm to 9.30pm. Guests can try a range of dishes from our all-you-can-eat buffet. Excellent hotel for a short break or overnight stop. We were very satisfied with our stay at your hotel. It was exceptionally clean and vibrant. The breakfast was excellent with plenty of choice and being replenished all the time. The location is good although about a 10 minute walk into the centre. Would definitely stay here again. 1/ I've booked 2 attached rooms (we have 2 kids), one with one big bed, and one with 2 beds and we have received room n°203 and 207 2/ no other solution was proposed 3/ when we opened the door for 203 and 207 both had big beds -> not convenient for 2 kids 4/ a solution was finally found with one family room, which could have been proposed earlier 5/ reimboursement was not done properly: I'm not convinced that the fare took into account my &quot;hotel accord&quot; bonus. Staff really helpful and friendly. Nice breakfast buffet. Clean room. Convenient location next to train station. We had a lovely time, the hotel was very clean, the breakfast was good and the location near the railway station was excellent. Really good stay. One night after late arrival at Blois raleway station. Really close to the station. Nice welcome from the staff. Room was really clean, confortable and quiet. Delicious breakfast with products sourced locally. Blois served as a great location for visiting chateaux in the Loire Valley. We stayed at other ibis hotels in France during our longer trip and the room size in Blois was the smallest of the ibis hotels we stayed at. Fortunately, we did not spend much time in the room. The hotel is located within a 5 minute walk of the train station on the other side of the tracks. It was about a 10 minute walk to the center of town. The restaurants in town provided a variety of excellent food. At the hotel, the staff was very helpful. The breakfast was very good and had a lot of variety. It was very comfortable and peaceful and the staff were as always very pleasant. The staff in the hotel were very friendly and welcoming at all times. They were quick to help with any queries I had. My room was very comfortable and was cleaned each day to a high standard. The hotel lobby provided enough space to relax in the evening and the furniture was comfortable and attractive. The only slight problem was caused by a noisy air conditioning unit outside the hotel. This was not a concern normally as the windows were shut most of the time and the noise could not be heard then. Adequate and good value. Carpet on the room floor would have been more comfortable. Evening meal disappointing. Hot food served on cold glass plate is not up to French standards. Processed food is not what we expect in France, even in the most simple restaurant. Staff very helpful and friendly. Hotel in good position in the centre of Blois and receptionist gave good advice abouti sight seeing. On the whole good value but do improve the evening meal. Breakfast great! The room for disabled was good, the bathroom was excellent. We could park in a disabled bay right by the front door. But their restaurant closes for Friday, Saturday and Sunday, and the menu is very limited the other days. And the nearest restaurant is not accessible by wheelchair, so we had to have a sandwich from a local shop - not very good. Excellent staff, facilities and breakfast !!! Fully satisfied with all aspects of service and room facilities. High standard accommodation and well proportioned room. 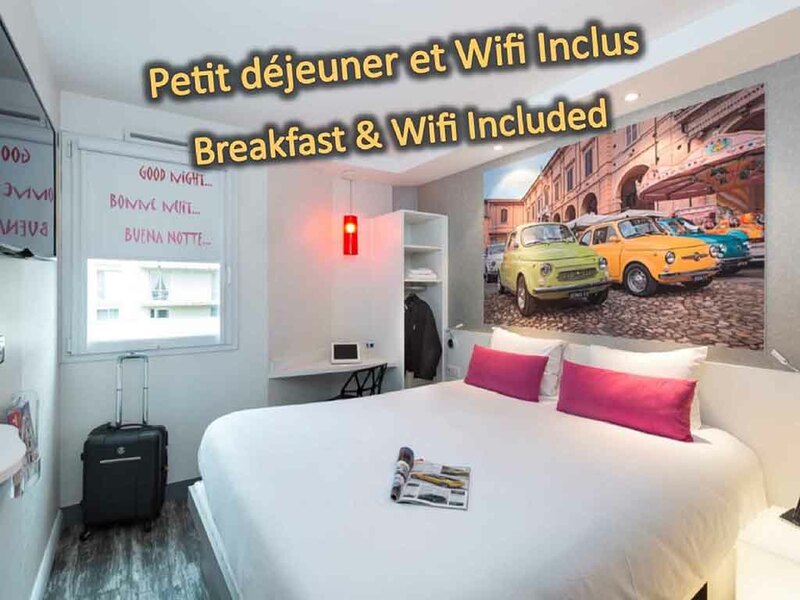 Great breakfast offer.No discernible outside noise.Option of parking at the Hotel (which is subject to availability) I would say is essential as there were not many other obvious places to park.Easy access to Blois town centre, Chateau and Loire river. Very clean and comfortable stay . Lovely breakfast good secure parking . Short walk into the town and restaurants. Very pleasant and welcoming staff. Good secure underground car park for our 2 Motorcycles. Handy Supermarket next door, nice walk into town - 15 minutes. Lovely historic quarters and excellent choice of restaurants. Nice walks next to the Loire. Horse drawn carriage tour well worth 7 Euros. The breakfast Room was understaffed. This meant that it ran out of milk and croissants and we had to ait until one of the two (yes, only two) staff who were available went to find them. Also it is almost incredible that an Accor hotel did not provide simple Kellogs cornflakes - not everyone approves of the sugared version. Helpful staff, having Air Conditioning and Private Garage. Excellent selection for breakfast in bright and spacious dining room, tea and coffee available through out the day and the evening. 15 minutes of walk to the Old Town and the Castle. We would return to this Hotel and make Blois our center for the Loire Chateaux visit. Thank you Alexander,Anais,Emeric, Michael, Mnu, Mina and Julie for a memorable summer. It has been a pleasure and privilege to know you. Vancan&PK&SPA&NN Best wishes !